Here’s the scoop: Audrey Cuttler is an ordinary 16-year-old girl who’s obsessed with music. Her first boyfriend, Evan, is part of a band, but when she realizes that he cares more about himself, his band, and music she decides to break it off. Using the pain of the break-up Evan writes a song titled, Audrey, Wait. The song is an immediate hit, and because some music exec. is at the concert, Evan’s band the Do Gooders are signed on. The song goes from college radio, to national radio, to national TV. And Audrey, the subject of the song is in middle of all of it. Audrey can do without the notoriety. But she is in the center of it all. She’s getting calls from reporters, offers to star in a reality TV shows, and offers to endorse lip gloss products. Not to mention she’s being stalked by the paparazzi. But all Audrey wants is to get to know James, the guy who works with her in the Scooper Dooper, an ice cream shop. Will the madness ever end for Audrey? When and how will her 15 minutes of fame end? This book is a really fast-paced and engaging read. 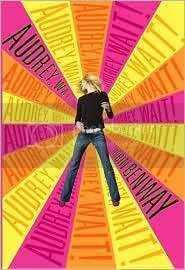 Audrey is a well-drawn character as is her best friend Victoria. She has loving parents (which seems like a real change in YA literature, or at least the literature I’ve been reading lately.) The madness of Audrey’s life is palpable and it’s hard not to go along for the ride. Music lovers especially will adore this title, because it’s riddled with tidbits about the music world, and captures the throbbing, pounding pulse of the music world. So some libraries will put this for high school age only. Some parents will choose to tell their children to wait and read this title. But for those who want and can read this book – it’s a fun ride.